Alrighty kids, last week’s MTV retrospective takeover was super fun, but now it’s back to our regularly scheduled programming. I’ve only done a “One Many, Many Bands” feature on mega-genius Aaron Sprinkle so far (found HERE), so it’s beyond time to take another multi-pronged musical magician and sketch out his expansive creative output. Mike Herrera is one of those guys that just exudes incredible musicianship, an intense work ethic and an unassuming rockstar cool. I usually refer to him as the “James Brown of Punk Rock” because he can definitely challenge anyone for the title of "hardest working man in the music business." He was signed to a label and released an album before he even got out of high school and he has managed to release something every single year since then. Hailing from Bremerton, WA, he managed to bypass all the alternative/grunge overexposure that was prevalent in that area in the early 90’s and put together one of the most talented, fun-loving and consistent punk bands of the last 20 years. He has navigated the fickle, choppy waters of the “music scene” and is still putting out some of the best music of his “no end in sight” career. It’s no secret that you’ve got to have a healthy amount of musical ability, songwriting chops and business savvy to be a successful artist for any length of time. While Mike has all three of those in spades, I think his continuous musical presence also has a lot to do with his kind spirit and personable approachability. When I interviewed him earlier this year, he was super gracious, laughed a lot and told some awesome stories. After the show, I saw him talking to every fan that dropped by the merch booth. It’s one thing to be a good musician and it’s another thing to be a good person. Put both of those qualities together, slap some tattoos on it and add an unquenchable thirst for musical creativity and you’ll have Mike Herrera. MxPx – Mike started MxPx when he was just 15 and had an album out on Tooth and Nail Records within two years. The band’s debut, Pokinatcha, was released in 1994 and I became an instant fan. Growing up, my mom and I seemed to be in a perpetual music buying battle with the exception of anything found at Sonrise, our local Christian bookstore. Due to MxPx’s positive messages and Christian background, this one made it into my collection without debate. Lyrically and sonically, Pokinatcha was a hugely influential album for me. It was one of those albums I discovered on my own, fell in love with and played non-stop. My favorite song on the album, “Want Ad,” helped me define what I was “looking for” in a girl and helped me realize that there is such a thing as romantic punk rock. In fact, Mike wrote songs about girls and growing up in a way that was pretty unique and couldn’t be easily found in other punk bands. I got to see MxPx a bunch in the 90’s thanks to their propensity for touring and their inclusion on the annual AtlantaFest roster for a few summers. In fact, volunteering at the AtlantaFest “Edge Stage” (hey, it was the 90’s) in 1996 afforded me a “sit down” conversation with Mike over dinner. I remember two main things about that experience. First, Mike was a super nice guy and his nonchalant, humble demeanor off stage made his powerful, controlling stage presence even more impressive. Second, MxPx played a blisteringly awesome set that was repeatedly interrupted by “shutdown threats” due to, among other things, the volume, the moshing and the curfew. I couldn’t help but smile when a few empty cardboard boxes from the MxPx merch stand ended up on the picnic pavilion roof after the hassling. With Mike just being a few years older than me, his songs always seemed like welcomed words from someone just a little farther up the path than me. Luckily for me there have been many of those moments to choose from over the years due to Mike’s prolific and poetic songwriting. Since 1994, Mike’s singing, songwriting and bass playing can be heard on MxPx’s 9 full length studio albums, 2 covers albums, 3 VHS/DVD releases, a live album and a handful of EPs, compilations and 7” singles. (They’ve also released a killer Christmas single each year, so you know they get extra points with me for that.) Although they don’t tour as a trio as much anymore, MxPx is still at it and they are currently in the studio recording their next album. The Cootees – Mike’s first side project came in 1996 with The Cootees album Let’s Play House. The Cootees featured Mike trading in his bass for an electric guitar and splitting the vocal duties. The line-up was rounded out with Jiles O’Neal on vocals and bass, Dale Yob on guitar and MxPx band member Tom Wisniewski on drums. Let’s Play House is pretty fun to listen to from a musical perspective and it’s a great time capsule of the raw skate punk that came out of the mid-90’s. However, with Mike only partially contributing to the project, it can be kind of hit or miss overall. When they do “hit” though, there’s a couple of pretty cool songs stuck in there. MxPx even “covered” two Cootees’ songs with “No Brain” appearing on 1995’s On The Cover and “I’m OK, You’re OK” appearing on 1998’s Slowly Going the Way of the Buffalo. Arthur – Mike’s second side project came in 1999 with the release of Arthur’s Loneliness Is Bliss EP. Comprised of all three MxPx members and their guitar tech Neil Hundt, Arthur headed in an alternative/emo type vein with Mike’s new batch of songs. The different direction was felt in his lyrical voice as well. Loneliness is Bliss definitely sounded like Mike was stretching his musical wings and Tom, Yuri and Neil added a lot of different musical flavors to the EP as well. Mike revived Arthur last year and the guys released their first full length, Watch the Years Crawl By. With Arthur, Mike first showed his ability to be a diverse songwriter and musician, regardless of the genre he is writing in. Tumbledown – Eventhough Mike is still going strong with MxPx, I just can’t bring myself to call Tumbledown a side project. Whether it’s the sheer strength and emotion of his songwriting or the nonstop push he has given to touring and recording, Tumbledown is Mike clicking on all cylinders. Taking the punk elements he has mastered in MxPx and adding in roots music like folk, classic country and rockabilly, Tumbledown is amazing and just plain fun to listen to. Spinning the bottle between good times and heartache, Mike writes songs that will make you want to party, put your arm around your girl, get in a fight or drown your sorrows. The one thing they don’t do is leave you unaffected. Even when Tumbledown had a horrible experience touring in Mexico that involved a van break-in, huge theft and a tour cancellation, Mike ended up just turning it into a really cool song. Even when he can’t tour with the whole band, Mike takes Tumbledown on the road as a solo act. Having seen it in person, I can guarantee you that Mike needs nothing more than an acoustic guitar to get people moving and singing along. In just a few years, Tumbledown has released two full length albums, an EP and a live album, all full of whiskey-soaked, boot stompers and tearjerkers. When Michael Jordan tried his hand at baseball, most people thought it would work. He’s great at one sport, so he’s got to be at least semi-good at another right? Not exactly. Jordan reminded us that being great in one area doesn’t mean that you’ll be great in other related areas. 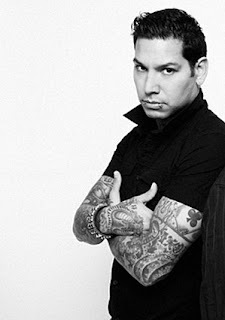 In that respect, Mike Herrera is the anti-Michael Jordan. Mike is incredibly proficient in the punk rock realm, but he has also succeeded in writing songs in other moods and genres. He's punk rock and he's more than punk rock. His songwriting talents and musical abilities have transcended above just one genre and have translated into many different areas. I’m sure he’s still probably got more up his sleeve that we haven’t seen. Mike is always putting out great releases and thankfully he seems to be full steam ahead. If Mike brings any of his many musical incarnations to your city, do yourself a favor and go to the show. Until then, he’s got more than enough music to keep your heart and ears satisfied.